Today, at the Food Waste Summit hosted by the National Consumers League (NCL) and Keystone Policy Center, FLPC, NCL, and Johns Hopkins University Center for Livable Future released their findings from a national survey on consumer perception of date labels in the report Consumer Perceptions of Date Labels: National Survey. The survey aimed to understand the extent to which consumers are confused about date labels, whether they throw away food after the date passes, perceptions about whether labels are federally regulated, and which labels most clearly communicate quality and safety, for purposes of standardizing the language. Each year, 40 percent of the food produced in the U.S. goes uneaten, resulting in 62.5 million tons of wasted food each year. Consumer confusion over date labels is a significant factor contributing to this waste. Many people throw away food once the date passes because they think the date is an indicator of safety, but in fact for most foods the date is a manufacturer’s best guess as to how long the product will be at its peak quality. With only a few exceptions, food will remain wholesome and safe to eat long past its expiration date. The survey, and subsequent report, confirms widespread consumer confusion over food date labeling and how it likely contributes to to the 40% of food wasted in the U.S. each year. According to the new survey more than one third of the population always or usually discard food close to or past the date on the label, and 84% do so at least occasionally. The survey also found that there was considerable uncertainty about the regulation of food labeling in the United States, with a third of American adults mistakenly believing the federal government regulates date labels. Only one percent of respondents responded correctly that only certain products are federally regulated; in fact, the only product for which date labels are regulated federally is infant formula. The reality is that all other foods are regulated at the state level or not at all, depending on the state. The survey findings also identified how consumers interpret date labels—whether terms communicate food safety vs. quality —findings which could be useful in supporting the efforts underway in Congress to standardize date labels. 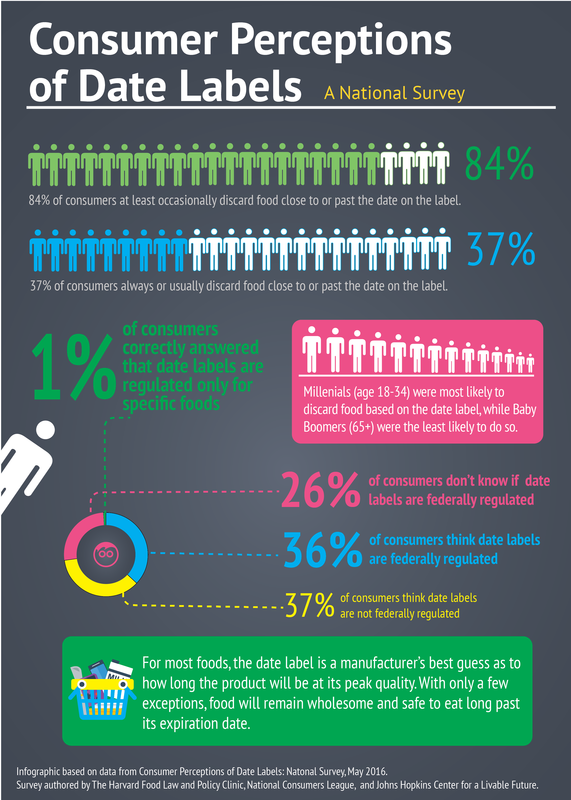 Read Consumer Perceptions of Date Labels: National Survey in full. Download an infographic based on the report.